What Would Sarah Do? Ancient advice for modern times. My whole life I have felt like the odd woman out within a boys' club. As a child, in college, in my professional life, and in my family, I am often the only woman amidst a group of men. It is as if I am "permitted" to be near them, but am never truly one of them. They do not seem to hear me (and certainly don't listen) when I talk, my ideas and contributions are ignored, and it makes me feel invisible. But because they are my family, or my coworkers, or sometimes even my friends, I can't simply walk away. At the end of the day I want to belong, to feel that I am part of the group I am with, and to be recognized—if not appreciated—for who I am and what I have to offer. Is there anything I can do to shift this dynamic? The Bible is the original boys' club. Once upon a time its stories might have originated in a matriarchal or matrilineal society, but by the time they were written down they were written and revised by men, for men, with a patriarchal agenda. This helped to establish a centuries-long tradition of men—and men alone—reading, writing, and studying the Bible, while women were relegated to the sphere of the household. Nonetheless, somehow some powerful women's stories managed to survive the Bible's long history of being written, edited, and redacted by men. And some strong women's stories remain to help guide us in the face of the same patriarchy they, too, faced. But they, too, often found themselves the lone, undervalued woman amongst a group of men. Sarah lived her life amidst a boys' club. No one sought her counsel when her only child was selected—by men—for sacrifice, and she had to eavesdrop on men's conversation to learn that she was going to bear a child in her old age. Rebecca was taken from her family home by a male servant, and went on to live a life surrounded by her husband and two sons. She had to resort to trickery to ensure that her favored son received her husband's blessing, indicating that the men in her life would not listen to her if she plead the case for her second son outright. Miriam was stricken with leprosy, exiled, and nearly killed because she dared to question her brother Moses. It was against the law—and punishable by death—for Ester to approach her own husband to ask him for anything. But, their is a another side to each of these stories. It was Sarah who dictated from whence her son's bride should come, and it was Sarah who insisted that her handmaid Hagar be banished, twice. In both cases her husband listened and did as his wife bade him to do. God even intervened, instructing Abraham to "listen to whatever Sarah tells you." Rebecca may have had to resort to trickery to place her chosen son next in line for inheritance, but in the end her wishes were honored. Abraham banishes Hagar and Ishmael. Artist unknown. Image labeled for reuse. Before being punished by God for her "impertinence," Miriam was a revered and beloved leader, and was one of only five women in the Hebrew Bible to be called a prophetess. 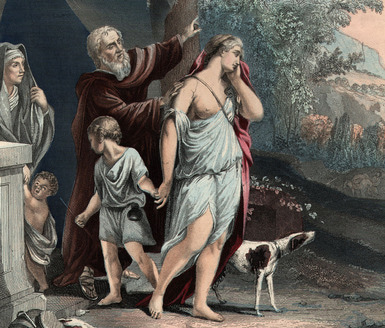 After her punishment, the people of Israel refused to continue on their journey until Miriam was restored to them. Ester courageously approached her husband despite the possible consequences, saving her people from annihilation. What would these women tell you? That this has been, for thousands of years, a man's world. That women's voices are all too often ignored and marginalized. That we women often live our lives on the fringes of boys' clubs, and that fighting against the status quo can have severe consequences. But that does not mean our voices are without power. That does not mean we do not have great contributions to make. And if we are unheard, ignored, and relegated to the sidelines, that does not mitigate the importance of who we are or what we have to say. At times we might need to think outside the box and be unconventional, even fearless, to make our voices heard. But if we are steadfast, we will be heard. I, too, have lived my life at the fringes of various boys' clubs. In academia, in the writing world, and in my own family. In the professional world, if women try to fit in by behaving "like men," we are thought cold. (Think Hillary Clinton.) If we try to be ourselves, we are marginalized and ignored. If we use our sexuality, we are labeled as sluts and accused of sleeping our way to the top. If we try to succeed by our talents alone, those talents are often ignored before ever being considered, strictly on the basis of our gender. (Think of all the female authors throughout the ages who have used genderless nom de plumes so that they could be judged on their work, not their gender.) And, when we do find our way into the professional world, this wonderful article from Role Reboot reminds us that "Men interrupt women, speak over them, and discount their contributions to a discussion with surprising regularity." And that's just in business. It isn't any easier for us when the men who ignore us are our own friends and family. For me, in many ways, being excluded from a boys' club of loved ones is even harder to bear. Sometimes I raise my voice so that I am heard, only to be told that I am too loud. Sometimes I call these men out on their behavior, only to be told that I am overly sensitive or overly emotional, i.e. "just being a woman." That being said, for as many years as I can remember, I have been speaking my mind even when my words fall on deaf ears. Speaking out against being relegated to the sidelines. Saying my piece, time and again, and always hoping that, this time, I will be heard. My advice to you would be to continue being yourself. Fight for yourself and your place in this world, no matter how unrelenting the opposition may seem to be. Despite thousands of years of obstacles, women have made great strides and invaluable contributions to society. There would be no Reviving Herstory if there were no inspirational women to celebrate. In addition to fighting for what is right, I urge you to find support wherever you are able. Raise your voice to those who will listen. Find—or create—a likeminded community who will support you as you battle this injustice. Start a discussion group at your work or amongst your friends to talk about these issues, and utilize a hive mind to overcome them. If you choose to have a partner in life, make sure that partner is a source of support and an open ear. Turn to understanding friends—be they women or progressive men—as a support system. Vent when you need to. Cry when you need to. Laugh when you can. And always remember that you—not they—determine your value and your worth.